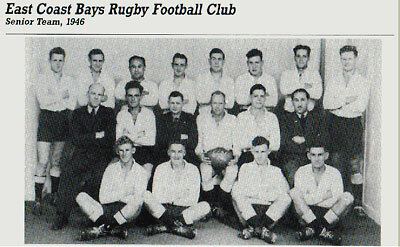 The East Coast Bays Rugby Football Club was founded in 1946, to cater for the sparsely populated (5,000) people of the East Coast Bays area on the North Shore of Auckland. The first President of the club, Lionel Webb, and the nine committee members, worked out of the first club rooms which consisted of two army huts at the Browns Bay Domain, later to be named Freyberg Park. Although the facilities were modest, they were a proud young club. It was, therefore, appropriate that the Domain was renamed Freyberg Park, after one of New Zealand’s greatest war time leaders, General Sir Bernard Freyberg VC who, as Lord Freyberg, was to become Governor General of New Zealand. In that first year of formation the Club gained second place in the Senior Competition run by the Kaipara Sub-Union. In those days the club wore white jerseys. Games which involved traveling to Auckland, the teams would travel on the back of the trustee truck driven by Norm Wigglesworth. Often game day was followed by a working bee the next day, as the clubrooms were built with voluntary labour. In those days players would wash in the stream behind the clubrooms.